You don’t even have to leave the house, unless it’s to work at your favorite coffee shop. And while that may sound good to some (raises hand), to others it can become isolating and downright lonely. From my perspective, even though I enjoy working on my own, I constantly push myself out into “real life” to interact with longtime colleagues and meet new people. Why? It’s because some of the pivotal moments of my career over the last decade resulted from relationships. And these relationships formed in real life, not just on Skype calls and iMessage. In this episode of Unemployable, I’m chatting with freelance writer Kaleigh Moore about the topic of relationships, and she has some amazing ideas on how to expand both the quantity and quality of work relationships for solos. The initiative she takes to organize these interactions is inspiring, even though she admits it takes a lot of courage for her to play that role. Kaleigh Moore: Hi, I’m Kaleigh Moore. I’m a freelance writer that works mostly with ecommerce and SaaS companies, creating blog content, and I’m unemployable. Whether you identify as a freelancer, consultant, coach, or solo entrepreneur, there’s never been a better time in history to accomplish so much as a single-person company. Just your skills, some key technology, and a network of VAs and fellow solos can accomplish big things. 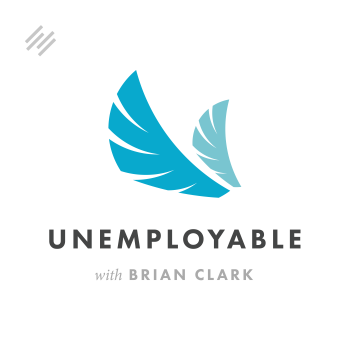 I’m Brian Clark and this is Unemployable, delivering practical advice for freelancers, entrepreneurs, and anyone else out there making it without a traditional job. Thanks for listening. Kaleigh Moore: I’m doing well. How are you? Brian Clark: I’m doing fine. It’s so nice to finally be able to interact. I guess, we basically just follow each other on Twitter, but I’ve seen a lot of what you’re writing about and you are somehow associated with that scoundrel Paul Jarvis. Brian Clark: No, I love Paul. I call him a scoundrel every time and he loves that. Kaleigh Moore: I’m sure he does. How Is the New Podcast Going? Brian Clark: He loves it when I mention his name, number one, but the fact that I call him a scoundrel is like extra icing, because he’s got knuckle tattoos and that’s kind of his thing. So how is that new podcast going? Kaleigh Moore: It’s going well. Paul and I just released the Creative Class Podcast, which went in conjunction with the latest release of the Creative Class, which he and I worked together on to revamp. I was actually a former student of the program and I took it when he first released it. So when he sent out an email earlier this year saying, “I’m looking for feedback on the course, I want to make it better.” I replied to the email with, “I can help with X, Y, and Z, and here’s why you need me.” And he emailed back almost right away and said, “Yes, I would love that. Let’s have you come on board and we’ll revamp this over the summer.” Then just a couple of weeks ago, actually, we closed the first launch bit. So, yeah, that was a great experience. It was great working with Paul. Brian Clark: That’s interesting. That’s exactly how Sonia Simone and I became business partners. We launched a course, she was one of the first people to sign up for it. Then she volunteered to take over editing for Copyblogger, because I was drowning. And then she became a partner and then on and on and on over the years. Brian Clark: Yeah, that’s how real relationships start and that is exactly the topic we’re going to talk about today. Before we get into that, tell us a little bit about your freelance. Is it just you right now? Brian Clark: Tell us a little bit about your business. Kaleigh Moore: I’ve been freelance writing for about four years now. When I started, I was doing a little bit more social media work. But after taking Paul’s course, the Creative Class, I decided to niche down a little bit more. Now I mostly just create blog content for ecommerce and SaaS companies. These are folks like Campaign Monitor, ecommerce platforms like BigCommerce and Big Cartel. Basically, I’m just helping them create educational content, things that are fun and engaging for people who come to the blog and are looking to either learn something or learn how to do something. Those are the types of things that I’m normally helping with. Then in my free time, I also do a little bit of writing for Inc. Magazine. In the past, I’ve written for a couple of other publications like that, like Entrepreneur. So, yeah, it keeps me busy. And then, like I said, with Paul and I just recently launching that course again, this has been a pretty busy fall for me. Brian Clark: Excellent. I like how you specialize. Even though ecommerce and SaaS are very different things, you’re still not saying, “I’ll do whatever.” I bet that helps you charge more money, which is nice. Kaleigh Moore: It does. I found that a lot of the companies that I work with, they actually do work together quite a bit either through integrations or through… They’re all essentially writing to the same type of audience and about the same topic. So there’s a lot of overlap between the two. You’re right. When I started I thought, “Man, these are entirely different worlds,” but every day I learned a little bit more about how they’re intertwined and how they work together. How Can Building Relationships Enhance Our Businesses? I know from personal experience that a lot of our biggest successes came from meeting people in real life. And I think you feel the same way, but you’ve even taken the whole relationship thing to a next level. So let’s go through that a little bit. Kaleigh Moore: I live in the Midwest in a very rural area, so there are not a lot of co-working spaces. There are not a lot of meetups or conferences nearby. I’m kind of between St. Louis and Chicago, so they’re not that far off, but they’re not a practical distance to where I could pop over for a day and go meet somebody there. It would take some serious travel. What I’ve been doing to combat that and to combat the loneliness that comes with working alone from home is to go to a few conferences a year. I think that that’s part of the equation. But I’m also taking steps to be very deliberate about making connections with other people and other writers and other people I would like to work with essentially. What I’m doing is, for example, once a year another writer and I will go and rent an Airbnb somewhere and then we’ll stay for a couple of days and work together. And of course, we’ll explore whatever city we’re in at the time. Last year it was Austin, this year it’ll be St. Louis. So that’s just some nice one-on-one time with someone who feels kind of like a coworker and that I can bounce ideas off of and troubleshoot with. That for me has been a really valuable experience. And it’s something I hope to continue to do as well, because like I said, it can get so isolating and so lonely when you’re living, especially, in a rural community and freelancing and there’s nobody around who really understands what you’re doing or the issues that you’re running into. How Do You Choose the People to Build Relationships With? Brian Clark: Yeah. That’s such an interesting idea. I’m a classic introvert, so it sounds horrible to me. I’m just kidding. I’m not that bad. But how do you choose who you want to spend that time with each year? Or is it just… I guess I’ll just leave it at that. How do you choose the person? Kaleigh Moore: Usually it’s somebody I worked pretty closely with throughout the year. I feel like there’s always somebody that you have as a go-to person when you’re freelancing. Either it’s somebody who does something very similar to what you’re doing or who knows a lot about the clients that you work with, something like that. So you end up going back and forth with them over email or hopping on a Skype call or something like that. It seemed a little strange to go meet an Internet random person that you’ve never spoken to in real life before. But the times that I’ve done it, it’s been an excellent experience. And I would highly recommend it to anybody else as well. Brian Clark: So this is like the freelance version of the company retreat. We would generally go once a year, all come together to interact and bond and all that good stuff. But also we would do some really serious work even though we are a virtual company and we work well that way. There’s something about being in a room with someone that you come to perhaps new ideas, new perspectives. Things happen faster, because you’re not going back and forth on Slack or something else like that. Has that been your experience? Kaleigh Moore: Absolutely. Like you said, there are those natural breaks that happen when you’re speaking to somebody through an online medium, whether it’s email or a Facebook chat or some other platform. It’s easy to just kind of set down the conversation and walk away. Whereas when you’re in person, you have that nice ability to have a conversation that flows and to have ideas flowing back and forth between two people, and have a really long, extended period of time where you can be in the same space and let that conversation continue without those interruptions. That’s been really nice. And like you said, I think that’s one of the biggest perks of doing this. Yes, you get work done, but you also have this person there who’s available to you to just help you talk through things for the future, talk through things that you’re working on in that moment, whatever it might be. That’s extremely helpful. Brian Clark: Yeah, and it’s just kind of eye opening, because with Paul’s upcoming book, the Company of One, and the more and more that individuals can leverage technology and other freelancers, contractors, solos, what have you, we can do amazing things without that physical presence. And yet, as you just pointed out, even for the solopreneur or the networked freelancer, it’s in your best interest to get together with people. Whether it’s, “Hey, are we all going to this conference?” which is convenient or something more deliberate like what you’re doing. Kaleigh Moore: Exactly. It’s so easy to stay at home inside your little bubble that is your office or whatever your workspace is. It’s so easy to just kind of stay inside there. But business I feel like is founded on those relationships and the ability to make new relationships with other people too. Because when somebody goes to hire a freelancer, in my instance a freelance writer, they want to hire somebody who someone else has recommended or who they already know personally. Because that validation is already there. Whereas if you’re not making those connections on a regular basis, that whole equation becomes much, much harder. And you don’t have those people who know you or who are getting to know you. So business growth and new opportunities are much harder to come by. What Are Some Strategies to Leverage the Virtual Environment to Enhance Relationships? Brian Clark: Yeah, absolutely. I know that you also have some other strategies or techniques, what have you, about actually leveraging the virtual environment in a way that enhances the relationship outside of normal workflow or whatever. Let’s talk about some of those. Kaleigh Moore: One of the things that I have been trying to be really deliberate about scheduling two or three of every month is kind of a virtual coffee date. I usually do this over Skype or Google Hangout. Most of the time that ends up in getting it on the calendar and we chat. Sometimes it becomes a standing meeting if it goes really well and we really kind of click. We will set them up on a recurring basis. Again, it’s kind of a two-fold benefit. I get to learn more about other people and what they’re doing and make those connections with people that I can either refer work to or that maybe potentially will need the services that I offer and they can send work my way. Then it also helps because I get really lonely and I don’t have any coworkers anymore. Having those virtual coffee chats when there’s nobody here in town for me to go get coffee with in real life is helpful for me. I mean, mental health wise, I think happiness with my work — it helps with all of those things. It helps me feel more connected even though I’m in a fairly isolated environment. How Prevalent Is Isolation for Freelancers? Brian Clark: Yeah, it’s so interesting for me, because again, I wouldn’t say isolation, but not having to interact with people is a feature for me, not a bug. But again, I do have a healthy speaking schedule and Boulder’s a great town for just getting together with people at any time. When you’re having these conversations and connections with other people, are you getting the sense that more people than not do feel that sense of isolation? Kaleigh Moore: I am. That’s one of the things that always comes up in these conversations. People say, “I’m so glad that you asked me to do this, because I don’t have an opportunity to do this as much as I would like with people who live near me or around me.” Or “I’ve been wanting to do this for a while and I just never have gotten around to it. So I’m glad that you asked.” Yeah, I think that it’s a fairly common point of struggle for a lot of people who are freelancing or maybe who work remotely for a company. It’s very work conducive most of the time to be by yourself and to really be able to put your head down and focus on whatever you’re working on. But also, if it’s cold outside and there’s not a lot you can do and your office is at home like it is for me, that’s a lot of time in the same space with not a lot of outside interaction. Brian Clark: In many ways, this is a genuine, authentic human need that also has the benefits of potential opportunity. Every relationship you make leads, in my experience, to something else. It may be a little thing, it may be a big thing. It may be nothing other than the relationship. But in business generally, whether it’s old school networking or the kind of ideas that you’re employing, it really does come back to you. Even though it is a genuine longing for interaction. Kaleigh Moore: Right. And you’re not going into these types of activities thinking, “Ooh, biz dev, I’m going to make deals.” At least, I never approach it that way. Brian Clark: I know, I’ve never been able to do that. But it tends to happen if you treat other people well and you actually care about them instead of the guys Paul was complaining about — God, we’re talking about Paul a lot. He complained about the automated sequence where they compliment you, and then they say they’re a subscriber, and then they say, “Will you do this for me?” That’s ridiculous. That’s not a relationship. That’s not real. Kaleigh Moore: Yeah, I think this approach is really just getting to know other people and being genuinely curious about what they’re doing. Taking notes during the call, so you can remember what you talked about. And then maybe when an opportunity that comes your way isn’t a good fit, you can send it to the appropriate person. That is someone maybe that you’ve met from these calls and these types of activities. You can be a connector of people essentially. It helps you be better at that. It’s not all about you and addressing your loneliness or wanting to hopefully get introduced for new opportunities down the road. Those are just kind of gravy things, I think. They’re just extras that come as a side effect of these types of activities and trying hard to stay connected to other people. Brian Clark: I think that’s the right way to think about it, but it goes even further. Let me illustrate how, because you’re taking initiative here and bringing people together, even though it’s something you desire from a human level. And even though you know there’s probably going to be some icing on that cake just through the natural course of those relationships, but in your case, it goes even further. Again, you’re taking on the role of organizer or… what’s the right word here? I mean, you’re taking the initiative at the beginning that puts you at the center over time, I would think, of a network of like-minded, connected people. You’re also moving into the realm of teaching similar people to you. So even though it’s not like, “I’m strategically going to take over the world,” this is how it happens. I wish more people understood that. Coming from a genuine place of being helpful and yet, all of a sudden, you wake up three or four years later and you have a radically different stature in business. Kaleigh Moore: Yeah. I think that does happen. And I have to be 100% honest. Being the person who’s doing the reaching out and being the person to take the first step in that whole equation is not always my favorite thing to do. I don’t always like being the person who’s taking that first step in making the ask, because it can be intimidating. Sometimes I don’t really feel like putting myself out there. I’m fine staying at home and really getting into work and focusing on things and getting a lot of things done. But I find that if I let this slide for even a few months, it really does catch up with me. In a way, it’s bad for business too, because then I’m not proactively trying to connect with other people and learn about what they’re working on. It helps me knowledge-wise too, to find out what things are happening with other folks and with other people who kind of work with the same industry and same clients as I do. So it has a lot of ripple effects as well. Brian Clark: You’d be surprised at how many people feel that exact same way. I mean, courage is not the absence of fear. It’s doing it anyway. That’s what you’re doing. And I know it’s going to work out for you even bigger than you think. So let’s talk about some of the common issues that you’ve run across other than isolation or loneliness by interacting, with working with people through Creative Class. Give me your top three issues that you think affect most freelancers or solo people and how you would deal with those things. Kaleigh Moore: The first one I hear about the most is either, “I have way too much work” or “I don’t have enough work.” It always seems to be at the two vastly different ends of the spectrum I guess. Usually, I’ll get a couple of referrals and no problem. So that’s what I always recommend to other people as well. Start with the network of people that you already have. Put the word out that you’re looking for some new projects to take on. And usually, if you are staying connected and your work as good, you’ll get those introductions made fairly quickly. The other end of the spectrum is when people are way too busy and they’re very stressed out. They are not enjoying freelancing at all, because they’re working nights, they’re working weekends. I feel like that’s when I always end up recommending offloading some of those projects to another freelancer who does similar work. Sometimes that’s me, which seems like, “Hey, I’ll, I’ll take care of that for you.” But sometimes that’s me. Sometimes, it’s somebody totally different that I’ll introduce for them. Being able to take those things off their plate and get back to a healthier work life balance, where they’re not pulling their hair out every day. It helps them get back to that sustainable point I think in their business where they know that they can keep doing this for a long time. So that’s the big one for sure. Brian Clark: Yeah, it’s two sides of the same problem when I used to take clients pre-Copyblogger. I was really good at marketing and really bad at systems and processes. So I was that guy who was working awful hours and unhappy. But it’s almost, it seems… I don’t know, I’ll let you decide. But it seems lack of marketing is almost more prevalent. People think that marketing will solve everything for them until they get into that very same boat when they have too much work. Kaleigh Moore: Yeah, I think that’s so true. When the marketing message is wrong or they’re not targeting the right people, then they’re doing all this hard work, but nothing’s panning out and they’re getting frustrated. So it causes a lot of problems. A lot of times it is just a matter of taking steps to get in front of the right people with the right message and having the proof to back up all of the work that you’re trying to promote. It’s a lot of moving parts, but it is doable. Brian Clark: Yeah. Preach that. I’ve been trying to teach people that for 12 years, and it works sometimes and sometimes it doesn’t. But we’ll see. How Helpful Is Technology to the Freelancer? Brian Clark: What’s your take on technology adoption, because we’ve now got software SaaS specifically that can do amazing things, again, for a single person or a very small team. And yet, I think the learning curve despite better onboarding, despite better usability, is just so overwhelming. I know it is for me. I’m purposely doing more hands-on stuff for myself because as CEO of a company of 65 people, they don’t let me do anything except my core job as it’s supposed to be. And yet, I like to feel like I’m right there hands-on and everything. Are you getting that kind of feel? More and more you’re seeing not general courses, you’re seeing courses like How to Use Mailchimp, How to Use Drip? Right? Very specific, but not a person who is associated with that brand. Kaleigh Moore: I think it really depends on the person or the team. That’s something I also have had to figure out for my own freelance work is that it can be tempting sometimes to go out and get subscriptions to all of the services. It’s really about testing and not just buying all the things and not just following the trend of hearing that there’s this great new tool and you have to have it right now. I think it’s about finding the ones that really work for you. For the companies that I work with as well, that seems to be the trend for them also, because they’re building out these marketing technology stacks with a lot of different tools and a lot of different moving parts. I’ve seen a couple of them fall to the wayside already out of the stack where they didn’t fit in with what they were trying to do, they weren’t producing the results that they needed. They were just hard to use and the team didn’t like them. So it’s really about ongoing testing and being okay to drop some things and to add some things along the way, at least in my experience. Brian Clark: No, you’re absolutely right. I mean, you have to figure out what the core platforms are and you do have to learn how to use them. But shiny object syndrome, it’s always chasing the next dollar, that’ll kill you. I mean, let’s face it, I built Copyblogger into an eight-figure company primarily with WordPress and now Google Docs, but it used to be Microsoft Word, because that’s what matters — the content. So the fact that I’m getting more into personalization and automation is the next wave. But if you don’t have the fundamental down, then don’t mess with the technology, because it’s not going to help you. Kaleigh Moore: Right, and the same for courses too. Like you said, there are courses for almost everything now. So you can go out and purchase them all or you can take your time and figure out the ones that are really going to help you and are going to help you focus on a very specific thing that you’re trying to change in your business. You don’t have to buy all of them. It can be tempting to do that. But I think really asking questions and finding out what other people have found to be effective is a great way to make a short list. Brian Clark: Yeah, absolutely. So what’s next for you? Where do you see yourself in a couple of years? Kaleigh Moore: That’s a good question. I’m always trying to think about this, but I haven’t been very good at it lately. The reason for that is I’m just very content with how things are going right now. I’ve been doing this for four years. The business is very sustainable. I have a lot of flexibility to travel. We’ve taken a couple of European trips in the past couple of years. I get to walk my dog whenever I feel like it. I get to go work at a coffee shop that’s about 45 minutes from where I live. So I’m very happy with how things are going and I’m doing everything I can to ensure that I can continue working at this level into the future. So I don’t have any major plans for scaling up or hiring team members, anything like that. I just want to keep doing what I’m doing, because I like it a lot. I really like the people I work with. I like the things that I’m writing about. I liked working on this course with Paul. That was kind of unusual and out of the ordinary for me. I take that back. There is one project that I’m working on right now and I don’t have a lot of details on it yet, because it’s just a landing page for now but it’s called the Yeah Write Club. And it’s just a fun project that I’m working on. I’m using some of my experience from my past life. Like I said, that’s very vague. I can’t give a lot of details right now, because it’s just a landing page. But that’s my one small, small project I’m working on for the future. Brian Clark: Sounds good to me. I mean, there is nothing wrong with arriving at a place where you feel really good about it and maintaining it. The only time I’ve seen that go wrong is when people become complacent and that doesn’t seem to be your personality type. Kaleigh Moore: No, no, I don’t think so. Like you said, I try to do things that help me at least be aware of the future and stay connected and always meeting new people. Because I know that even if I get to a point where I can’t continue to write blog content in the future — maybe people decide that they don’t want blogs anymore, or video becomes the thing next — at least I’ll have this network of people that I can reach out to and hopefully evolve into something different and still work with the same types of people and use my experience and things like that. Brian Clark: Kaleigh, thank you so much for joining us today. Kaleigh Moore: Thank you. This was great. Brian Clark: All right, Everyone. I think the takeaway here from my personal experience and also from Kaleigh’s is relationships matter. Solo doesn’t mean alone and that’s not even probably healthy for yourself or your business. Also, get to a place where you’re happy and don’t worry about it, although you know what I’m going to tell you — keep going.